Last night, as I caught up on Facebook, Twitter, and Glee, simultaneously, I came across a tweet from one of the folks I follow via about four different accounts that sparked my interest since I'd caught a glimmer of something brewing over at Etsy about a recent featured seller interview. It's taken me awhile to wrap my brain around what's going on, working my way backwards. Today, I've been perusing the Etsy forums and news blog and read this post, which is obviously, but not directly (they've yet to issue a direct statement or apology about essentially featuring a distributor), in relation to the interview and resulting kerkuffle. Etsy now describes the seller/shop as a "collective," since the seller supposedly works with a half-dozen or so, first-name-only "carpenters." Now, don't get me wrong, I love me some Etsy. I do a fair amount of shopping there and, of course, make my meager living thanks to how easy the site has made it for me to begin and grow my business. But thank God for Regretsy at times like these, right? If you're curious about the latest kerkuffle (is the shop a "collective", which itself poses some interesting questions for the site, or is it a "reseller", which is a whole 'nother bag of worms? ), I suggest you read Regretsy's series of posts on the topic, in this order: whoa, then the who and the what now?, then un-freakin'-believable. It will rock your handmade world. Dude, I ran through fire! I wrote in my pre-marathon post that I'd have a recap in the week or so following the marathon... Next week, next month - who's keeping track, right? But seriously, now, did you think I was still out there? Like the epic finish in Run Fat Boy Run? Well, I'll cut to the chase and let you know that I did indeed finish, only about five hours and fifty minutes after I started. But I finished. Let's back up a bit, though, shall we? On Saturday, as planned, I headed to the race expo to pick up my bib, finisher's shirt, and a pathetic assortment of freebies. In fact, all I managed to squeeze out of that expo was a Gu sample and a Geico lizard pez for my son. 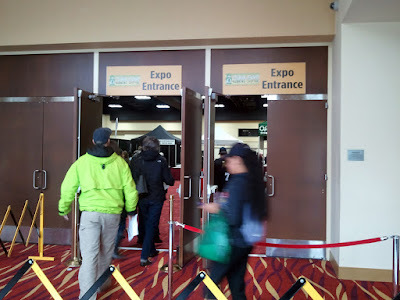 I wasn't expecting much, though - as a young marathon (well, the return of it, anyway), the ORF expo is notorious for leaving runners feeling a little underwhelmed. So what did I watch for my final "pasta and a movie" night? Nothing running related - after watching Running the Sahara the night before and having a really hard time falling asleep (that American runner is a piece of work, huh? ), I didn't want to take any chances on Saturday night's sleep. I know we watched the remake of Footloose sometime that weekend, but I honesty can't remember if it was the night before or the night after. It did get me thinking about a dance movie series leading up to the premier of So You Think You Can Dance...but that's another post entirely. I slept pretty well that night, surprisingly, waking up at 5 am Sunday morning to begin getting ready. I took a shower, chose one of the two finalist running outfits (going with my tights over the running skirt I'd only worn for shorter runs), enjoyed a breakfast of peanut butter toast with banana and a cup of coffee, and headed to Snow Park, deceptively similar in routine to my weekly morning runs. I didn't plan on listening to music during the marathon but did want a song or two to get pumped up on the way. I never did get around to creating an on-the-way playlist but I lucked out when Kelly Clarkson's "Stronger" came on (is it "(Stronger) What Doesn't Kill You" or "Stronger (What Doesn't Kill You)"? ), followed by Britney Spears (I forget which song...Does it matter? ), both perfect for getting in the running spirit. 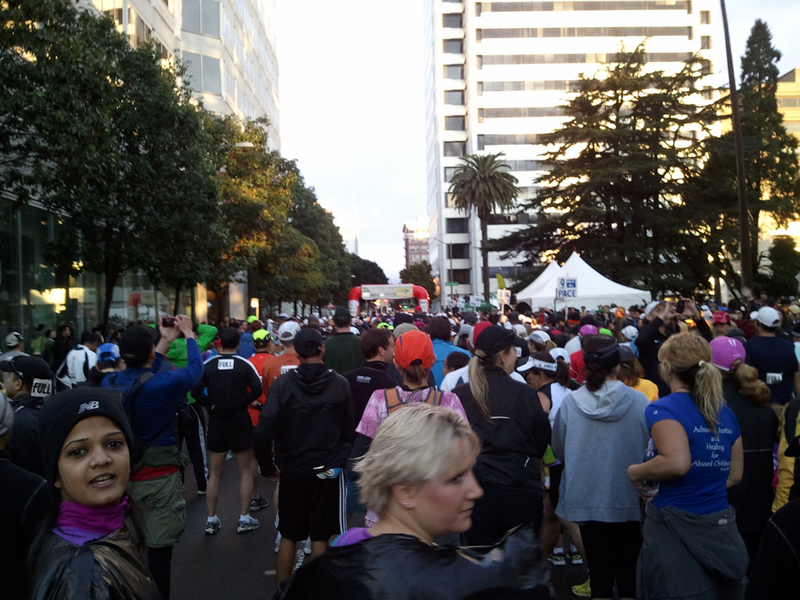 The entire pre-race experience in Oakland was so different than my memories of Big Sur (getting up cuh-razy early, being bussed to the starting area, waiting forever for a porta potty, only to feel rushed to finally get in line to begin!). 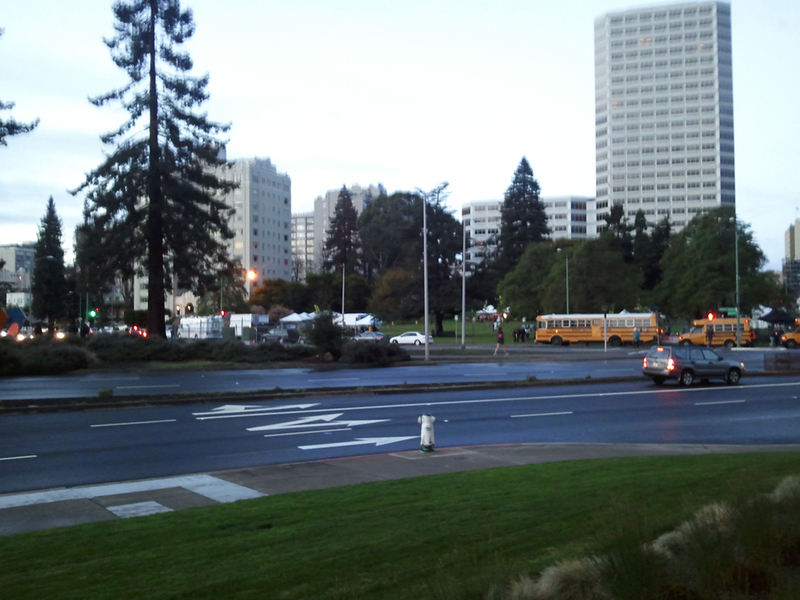 It took me all of ten minutes to drive and park at the corner of Harrison and Grand. I walked the couple of blocks from there to Snow Park, chose one of several empty porta potties, changed out of my warm-up clothes and checked my bag, and still had time to pose for a picture and take one of my own of the starting area before heading to the TNT meeting spot. There was much concern about the weather, as earlier in the week the forecast was pretty solidly calling for rain. 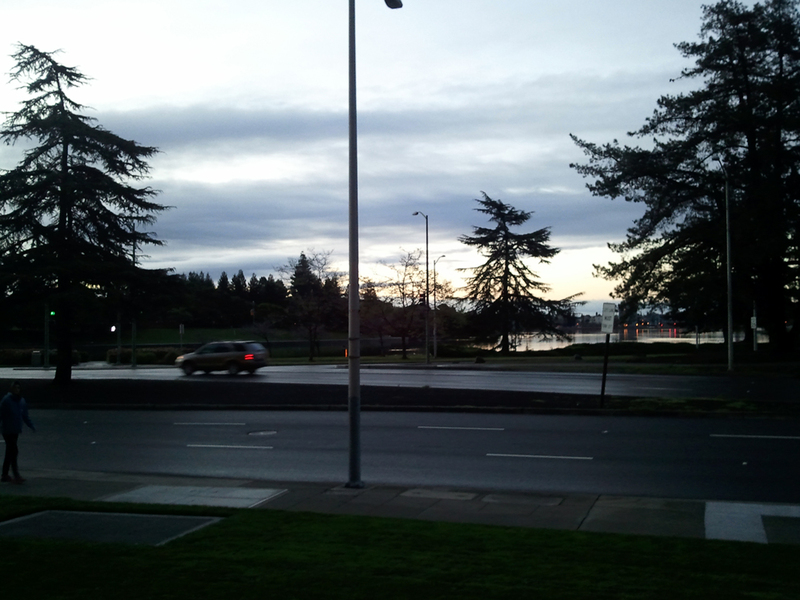 But, as you can see from the image above, the clouds parted and the sun was rising. All of which put me in a downright giddy mood. I warmed up a bit with my fellow TNT teammates before walking back to Snow Park, pictured above, and made my way to the back of the group, knowing I'd likely finish after even the final pace group (pacing runners to a 5 hour finish). The 5K race started right after the full marathon so we had quite an audience. I enjoyed an encore serenade from Kelly (it's a popular running playlist selection, can you tell?) and nervous chatter with a few other TNT runners. And then we were off. They're actually pretty similar so I'm not sure what I did differently this time. Kept my head down and ran "through the hill," as Coach Al says. The real kicker, as far as hills go, were the "rolling hills" that immediately followed, between miles 9 and 11. 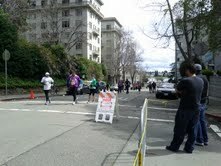 That last bit, right before mile 11, got me walking for the first time this marathon. But the view from the top was well worth it. This picture doesn't do it justice, but that's San Francisco there in the center of the image, running alongside the Mormon Temple (not pictured; the golden dome you see is actually the Greek Orthodox Church just down the hill from the Mormon Temple...either way, they both enjoy killer views). 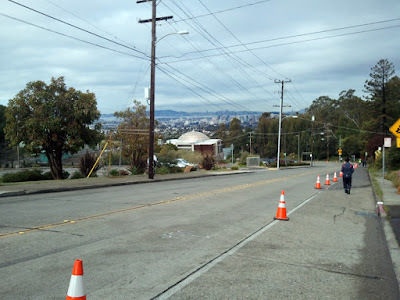 I continued to walk a bit down this steep decline until we were solidly in Oakland's Dimond district, worried that any steep downhill running would kill my knees, and still tentatively just waiting for the IT band pain to start up. It was more or less downhill or flat from that point on. I was hoping to rendez-vous with the fam' near Fruitvale Bart, the 14 mile mark, but a half-hour wait for the bus delayed them getting to that point. And I obviously wasn't going to wait around! My time was pretty good at this point, too, holding a steady 10:30-11 minute mile pace, and I started to get my hopes up for a PR, despite that not being in the game plan a couple of hours before. Probably not coincidentally, since 14 miles was my longest run pre-marathon, I hit a little bit of a wall, I guess you could say, around then. Maybe it was the disappointment of not seeing friends and family I'd hoped to see between miles 13 and 14, maybe it was the pain in my feet (when I'd been expecting it in my knees, not my feet! 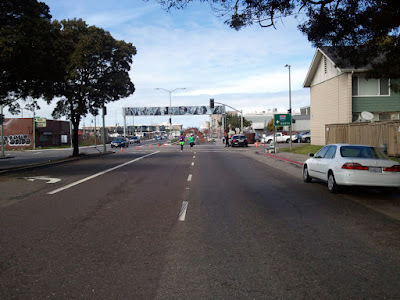 ), or maybe it was the knowledge that despite being in the flats, I had 12+ miles to go. Whatever it was, things got, well, challenging between miles 14 and 20. I was running from water stop to water stop at that point, roughly every two miles, when I'd walk a bit. My average pace slowed considerably at this point and there went my brief dreams of a marathon PR. I was also bummed that there wasn't more distraction along the course - I'd been really pumped up about the bands (several of which canceled due to the forecasted possibility of rain) and what I'd heard was a pretty good community turnout in different neighborhoods. 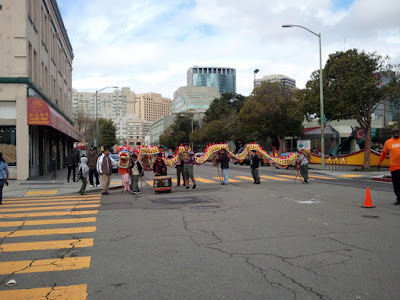 There were some areas of note (Rockridge Bart area, Montclair Village, the Dimond district, the kids from St. Elizabeth High in Fruitvale, for example), but overall it was pretty quiet along International Blvd. You definitely got the feeling that there were a lot of folks surprised by the road closures, crossing over the lanes anyway and resulting in much horn-honking and police whistles. Kind of annoying and very different from my experience in Big Sur. 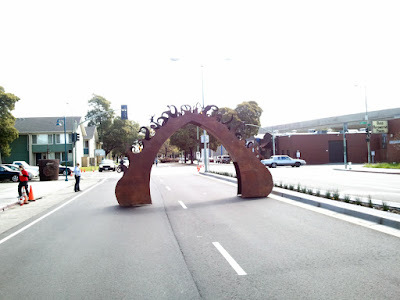 But, just in the nick of time, the much-anticipated "arch of fire" appeared ahead of me along 7th Street. There I am, running through it. The actual fire wasn't as impressive as I'd imagined - in fact, you can barely see it in this picture - but whatever, dude, I ran through fire. The next few miles felt pretty good. 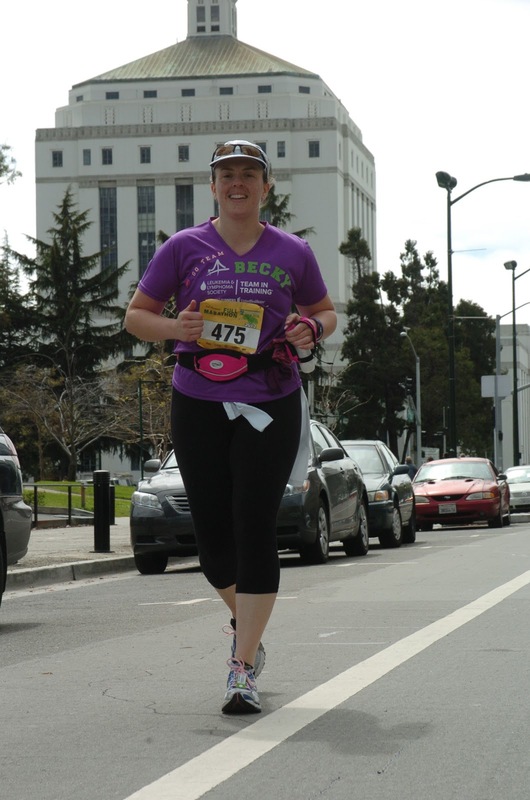 My feet were really killing me at this point but I enjoyed running through one of the few areas of Oakland I haven't spent a lot of time in - West Oakland. Now home to the fairly well-known Brown Sugar Kitchen (which I think is pictured in the thumbnail image below, if I remember correctly), there aren't all that many reasons to head out that way, other than picking up the occasional postacrd order from PS Print, or making my way from Target or Michael's to 880. But I really enjoyed this section for some reason. I was also sufficiently rejuvenated by the TNT cheer station around mile 20 or so and an appearance by mentor and now ultra-runner Anya (who briefly ran alongside me - in boots!) and Mama Lisa and her cowbell shortly after. I had my phone so Neal could track me and so I could take pictures and I'd packed my single ear bud just in case I felt I needed music. Well, after about mile 22 or so, shortly before hitting the lake, I felt I needed it. It did help a bit but the lake was still tough. It's become such an easy 3 to 3 1/2 mile loop that I've run four times in one week before (and sometimes twice around in one run), but that lake has never felt so endless as it did between miles 24 and 26. The real kicker was when we turned onto Lakeshore Ave., instead of running on the sidewalk or trail that hugs the lake, they had us on the street. But unlike the first 23 miles, we were limited to the bike lane, the area of the road that's really banked. Finding the higher, flat portion of the road wasn't an option and just that little bit of side incline, after a challenging 23 miles already, resulted in a tweaked peroneus brevis tendon in my left foot that took a solid three to four weeks to fully recover. But not finishing was never an option, certainly not this close to the finish line. With a 7 hour time limit, I figured I could probably finish even if I had to walk most of it! So there I am, above, between miles 25 and 26, making my way around the north side of the lake to the start/finish area. I finished strong, with the final .2 incline and Neal and Elias finally in view. Five hours, fifty minutes later. 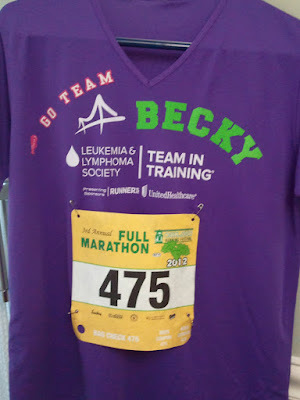 No PR for me, but I finished and I finished running and my knees never gave me any problems. My feet were another story. 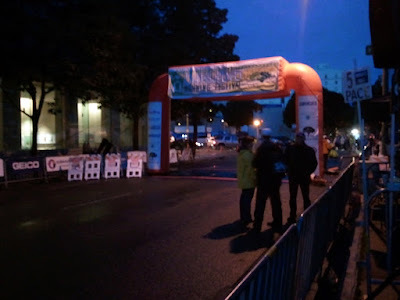 It probably didn't help that we wandered around the finish area for a solid half-hour, trying to decide if I wanted to go to the victory celebration at Luka's Taproom or if I'd prefer to just go home for a cold bath, a hot shower, and a long nap. I opted for the latter. 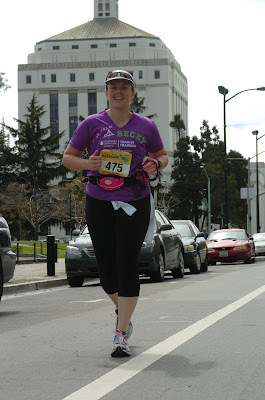 I actually felt pretty miserable immediately after finishing, which is different than my memories of Big Sur. After Big Sur I remember most of my pain disappearing as soon as I stopped running, and generally alternating between feelings of euphoria and ravenous hunger. But after Oakland I felt nauseous and dead-tired and the pain most definitely did not go away until I was completely off my feet for awhile. That said, it didn't take me long to rally. 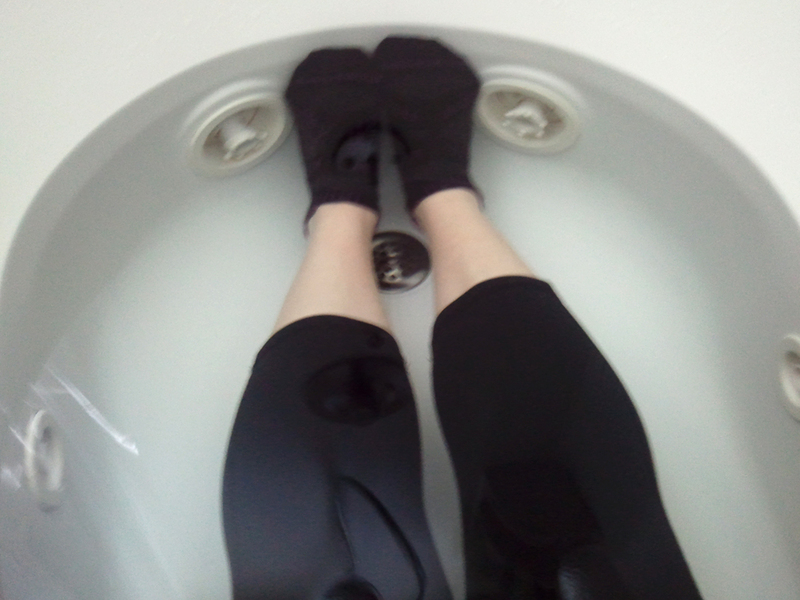 I soaked in the cold bath as long as I could stand it, followed by a warm shower, and about an hour-long nap. 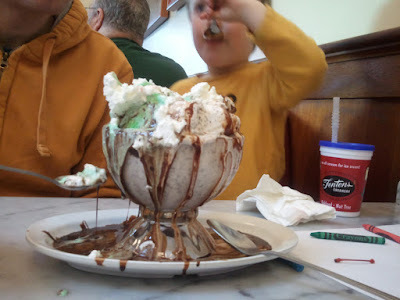 Around 4 pm I woke up but stayed in bed for awhile, until I felt ready to don my ORF 2012 finisher's shirt and head to Fenton's with the fam' for a celebratory BLT and sundae. So worth it. Fast-forward almost five weeks and I'm finally feeling fully recovered. My foot was causing me so much pain in the days immediately following the marathon that I went to my podiatrist the Wednesday after where she confirmed the strained tendon mentioned above, pretty certain nothing was broken or torn, and recommended these insoles, which are finally on their way. I've only run four or five times since the marathon (instead spending much of my workout time tackling Jillian Michaels' 30 Day Shred) with the last couple of runs feeling pretty darn good, making it all the way around the lake without stopping, without foot or knee pain, and even pushing my typical 9 minute mile pace yesterday morning. But I don't have any immediate plans for another race, nor did I stay on with TNT as a mentor, despite being very tempted to apply. As much as I enjoy the group and the training, something had to come off the plate and that was the most obvious choice. But I raised almost $2000, surpassing my minimum fundraising commitment by a couple hundred dollars (almost $500 if you take my alumni status and discount into consideration) and feel pretty good about my marathon finish, slow as it was, particularly considering where I was just a couple of months ago. And I'm happy that I'm done!